The UST Tool A Long Bass is a pocket-sized, stainless steel multi-tool that is designed to accomplish a variety of tasks outdoors or on the go. The included carabiner makes it easily accessible on your gear, belt, bag, and more. TSA-compliant for safe travel. 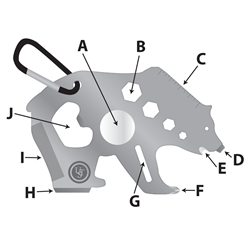 The UST Tool A Long Bear is a pocket-sized, stainless steel multi-tool that is designed to accomplish a variety of tasks outdoors or on the go. The included carabiner makes it easily accessible on your gear, belt, bag, and more. TSA-compliant for safe travel. The UST Tool A Long Bicycle is a pocket-sized, stainless steel multi-tool that is designed to accomplish a variety of tasks outdoors or on the go. The included carabiner makes it easily accessible on your gear, belt, bags, and more. TSA-compliant for safe travel. The UST Tool A Long Boot is a pocket-sized, stainless steel multi-tool that is designed to accomplish a variety of tasks outdoors or on the go. The included carabiner makes it easily accessible on your gear, belt, bags, and more. TSA-compliant for safe travel. The UST Tool A Long Deer is a pocket-sized, stainless steel multi-tool that is designed to accomplish a variety of tasks outdoors or on the go. The included carabiner makes it easily accessible on your gear, belt, bag, and more. TSA-compliant for safe travel. The UST Tool A Long Micro Dog is a pocket-sized, stainless steel multi-tool that is designed to accomplish a variety of tasks outdoors or on the go. The included carabiner makes it easily accessible on your gear, belt, bags, and more. TSA-compliant for safe travel. The UST Tool A Long Micro Kayak is a pocket-sized, stainless steel multi-tool that is designed to accomplish a variety of tasks outdoors or on the go. The included carabiner makes it easily accessible on your gear, belt, bags, and more. TSA-compliant for safe travel. The UST Tool A Long Micro Pine Tree is a pocket-sized, stainless steel multi-tool that is designed to accomplish a variety of tasks outdoors or on the go. The included carabiner makes it easily accessible on your gear, belt, bags, and more. TSA-compliant for safe travel. The UST Tool A Long Moose is a pocket-sized, stainless steel multi-tool that is designed to accomplish a variety of tasks outdoors or on the go. The included carabiner makes it easily accessible on your gear, belt, bags, and more. TSA-compliant for safe travel. The UST Tool A Long Sail Boat is a pocket-sized, stainless steel multi-tool that is designed to accomplish a variety of tasks outdoors or on the go. The included carabiner makes it easily accessible on your gear, belt, bags, and more. TSA-compliant for safe travel. The UST Tool A Long Sasquatch is a pocket-sized, stainless steel multi-tool that is designed to accomplish a variety of tasks outdoors or on the go. The included carabiner makes it easily accessible on your gear, belt, bags, and more. TSA-compliant for safe travel. The UST Tool A Long Shark is a pocket-sized, stainless steel multi-tool that is designed to accomplish a variety of tasks outdoors or on the go. The included carabiner makes it easily accessible on your gear, belt, bags, and more. TSA-compliant for safe travel. The UST Tool A Long Sloth is a pocket-sized, stainless steel multi-tool that is designed to accomplish a variety of tasks outdoors or on the go. The included carabiner makes it easily accessible on your gear, belt, bag, and more. TSA-compliant for safe travel. The UST Tool A Long Spork is a pocket-sized, stainless steel multi-tool that is designed to accomplish a variety of tasks outdoors or on the go. The included carabiner makes it easily accessible on your gear, belt, bag, and more. TSA-compliant for safe travel. The UST Tool A Long Trout is a pocket-sized, stainless steel multi-tool that is designed to accomplish a variety of tasks outdoors or on the go. The included carabiner makes it easily accessible on your gear, belt, bag, and more. TSA-compliant for safe travel. Tool A Longs are an all-new collection of pocket-sized, stainless steel multi-tools designed to accomplish a variety of tasks outdoors or on the go. Tool A Long products can include everything from cord-cutters to hex wrenches, all in one convenient, easily portable device. The included carabiner makes it easily accessible on gear, belts, bags, and more, all TSA-compliant for safe travel.